Blowing & Drifting Snow Headed for Washington! A Winter Storm Watch has been issued by the National Weather Service for the entire Washington Region for the potential of 5 or more inches of snow accumulation on Tuesday. It will be a spectacular Martin Luther King Day across the National Capital Region as temperatures rise into the middle to upper 50s under mostly sunny skies! Don’t let the mild weather fool you, blowing and drifting snow will impact the Washington Area with treacherous travel tomorrow! 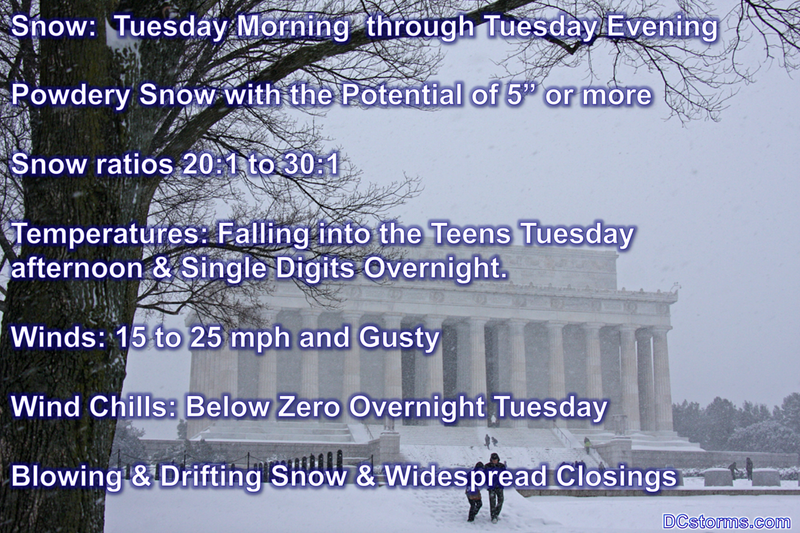 An arctic front, upper level disturbance and developing coastal storm will all combine to produce snow… heavy at times across the entire National Capital Region on Tuesday. Snow will start out wet but will transition over to a dry snow as temperatures plummet into the teens. I will put out a snowfall accumulation map today as soon as I pin down where I believe the bull’s-eye may fall. Stay Tuned.